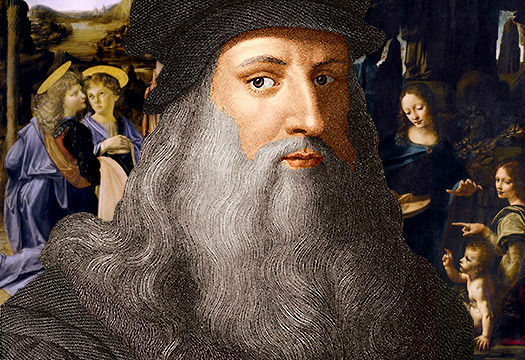 The whole wide world knows the name Leonardo da Vinci – born in 1452, the illegitimate polymath artist/scientist/inventor son of a Tuscan notary and his peasant lover. As early as the age of 15 he was sent to the studio of Andrea del Verrocchio in Florence and met and painted with Sandro Botticelli. At the age of 22 he painted The Baptism of Christ, now in the Uffizi Gallery in Florence. Ask people where Leonardo died however, and most will guess at somewhere in Italy. But they’re wrong – he actually passed away on May 2nd 1519 in his final home the Chateau du Clos Lucé in the Loire Valley. 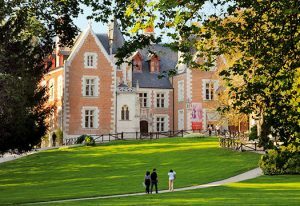 A wonderful old castle, where he was invited to come and live by King Francis I, it is now a museum and a park which we happily visit every week from our Loire canal barge, Nymphea. Leonardo had a remarkable career. In 1481 he painted the Adoration of the Magi, also in the Uffizi. 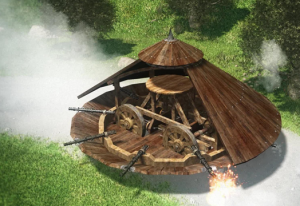 In 1482 he moved to Milan, working as an architect and designing a great number of war machines. Between 1494-97 he created an absolutely wonderful masterpiece in The Last Supper, now preserved at the convent of Santa Maria delle Grazie in Milan. His most famous painting, although arguably the earlier pieces mentioned above are better, is the Mona Lisa now housed in the Louvre in Paris. Most of our guests arrive and depart through Paris and many take a few days out to visit the Louvre and the many other famous galleries. If you stay centrally, most of the great art is within walking distance. But the Chateau de Clos Lucé, hidden away in the valley of the Loire, is a delight in its own right. Built in 1471, it became the summer house for the Kings of France. 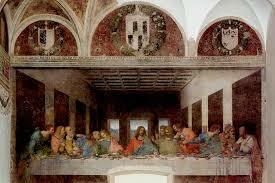 It has a superb chapel decorated with frescoes painted by Leonardo’s pupils. 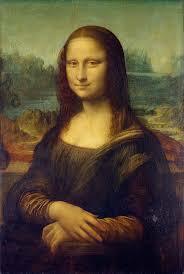 Leonardo himself moved here in 1516, appointed by Francis as ‘Premier painter and Engineer and Architect to the King’. Surprisingly it’s little known outside the area, and never really that busy. His visionary creativity is quite mind-boggling in its ingenuity giving you plenty to think about whilst you stroll through the gardens and grounds. Not to mention plenty to talk about when you get back on Nymphea with a glass of champagne on deck before dinner! For more information on our Loire itinerary click here.